The Tomatometer rating – based on the published opinions of hundreds of film and television critics – is a trusted measurement of movie and TV programming quality for millions of moviegoers. It represents the percentage of professional critic reviews that are positive for a given film or television show. From RT Users Like You! The Tomatometer is 60% or higher. The Tomatometer is 59% or lower. Movies and TV shows are Certified Fresh with a steady Tomatometer of 75% or higher after a set amount of reviews (80 for wide-release movies, 40 for limited-release movies, 20 for TV shows), including 5 reviews from Top Critics. Percentage of users who rate a movie or TV show positively. Heartwarming and harmless? Sure, why not. But it's also numbing in its simplicity and often rather annoying. The combination of Home's layered message, fun score, and clever comedy make it a colorful choice for moviegoers of any age. Anyone over 10 will see the plot twists a mile away. Kids will probably enjoy the goofy Boovs, the rainbows of colors and the music. Call me a traditionalist, but I still say the world was a better place before those darn Boovs invaded. A surprisingly moving tale of friendship and family, dressed up as an adorably frivolous sci-fi comedy. Maybe it's because kids sometimes feel like aliens in a grown-up world, but from E.T. and Elliott to Lilo and Stitch, pairing a child with a creature from outer space can prove to be a winning combination. Aside from Parsons' initially amusingly mangled Yoda-like English, which gets a tad repetitive, Home doesn't stand out as fresh or particularly funny. Tension is one of "Home's" biggest issues. There just isn't nearly enough of it. Story is another. Even a kids' movie needs more complexity and more invention. A charming concoction with positive messages for younger children about conquering fears, understanding outsiders and knowing yourself. Director Tim Johnson ("Over the Hedge") and his animators can't maintain this level of freshness throughout, but that's where Parsons and his goofy charm take over. It works moderately well thanks largely to the voice talents of Jim Parsons and, to a lesser extent, Steve Martin. Two droll dudes who put a fair share of funny into this animated picture. Tim Johnson ( Antz) has capitalized on DreamWorks' proprietary animation platform, Apollo to create a rich, intricate setting...But the technology doesn't save the film from falling flat on other levels. Frenetic direction and supercharged cuteness pitch in to aid in the distraction, and it's almost enough to produce a kind of numbness. Aggressive and cynical approach to children's entertainment, pummeling viewers with mechanical-looking action sequences (which suggest video game demos), unfunny one-liners, and overly loud pop songs and sound effects. Key characters are admirably diverse, but the fast-paced tale is thoroughly predictable. 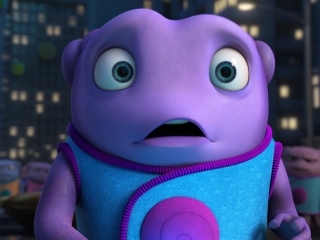 The film moves quickly and keeps the jokes coming, which only means that "Home" would rather keep young viewers occupied than give them something to think about. When we scratch beneath the sugary surface, there's something tart inside that's difficult to digest. Lazy gags, and it's been done better elsewhere. This kiddie sci-fi adaptation doesn't quite live up to its evocative title. I brought a couple of my kids, who liked it fine and found the friendship at the center rather affecting. While watching "Home," a comical animated spin on alien-attack thrillers with the usual tacked-on touchy-feely messages, I began to get bored as did the families seated around me. DreamWorks movies are often about outsiders learning that they don't have to fit in, a lesson the filmmakers may not have absorbed themselves. The Gummi-colored animation is imaginative, but director Tim Johnson's ho-hum 3D cartoon remains strictly 1D. Like the timorous Boov, "Home" has little interest in risk-taking. As animated sci-fi for small fry, it's a success whose modest but well-executed ambitions are no small part of its charm. An earnest exercise that falls flat, despite the best of intentions. Home is schematic and moralistic in the frequent manner of modern American cartoons, although the moralising doesn't entirely make sense: there are a couple of underlying metaphors that don't quite mesh. The film takes the lazy route of cannibalising pop cultural references rather than coming up with decent jokes. Inoffensive but flavourless, and crammed with familiar elements from better movies like Lilo and Stitch , Toy Story and Despicable Me . There may be no place like home, but there are a lot of places like Home, an animated adventure about the unlikely friendship between a lonely girl and an alien misfit that can't help but feel familiar. From a creative standpoint, this is the studio's least exciting feature yet - hardly its worst, execution-wise, but entirely lacking in the risk-taking spirit that has spawned such successful franchises as "Shrek," "Kung Fu Panda" and "Dragon." Copyright © 2018 Fandango. All rights reserved.